From Pontalun quarry, near Bridgend, Glamorgan. Reconstruction of the lower jaw of Morganucodon. This specimen is part of the lower jaw of one of our very first mammal ancestors. It lived in the Early Jurassic, 200 million years ago, at the same time as some of the earliest dinosaurs. 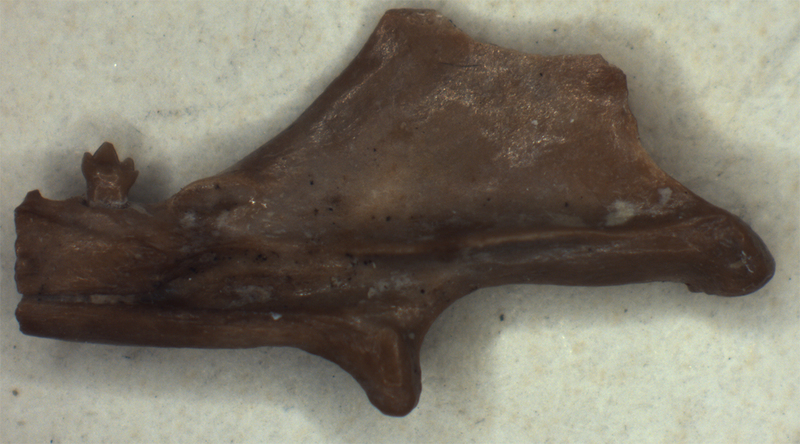 Morganucodon (=Eozostrodon) was a tiny shrew sized mammal and it lived on a small limestone island in what is now Glamorgan, along with another early mammal Kuehneotherium. Hundreds of bones of these creatures accumulated in small subsurface caves, and have now been exposed by quarrying. I have chosen this specimen of Morganucodon as it is one that was used to make a complete reconstruction of the lower jaw. Because the bones were broken when they were swept into the caves and there are no complete jaws preserved. This fossil is only a few millimeters long and is of the back end of the jaw, showing the strong jaw joint and the final molar tooth. Eo D61 and other specimens were taken to the synchrotron in Zurich for high resolution CT scanning to make 3D reconstructions. Three specimens were digitally “stitched together” (see the image above) to make a complete jaw, with Eo D61 as the posterior end. Biomechanical models were made from the reconstructions of Morganucodon and Kuehneotherium and showed that Morganucodon could eat hard food such as beetles, but Kuehneotherium could only slice up soft food like moths. So even the very first mammals had evolved to eat different diets so that they were not competing for food.